I just saw this story — the second like it in the past year — circling around Facebook. I love this post. 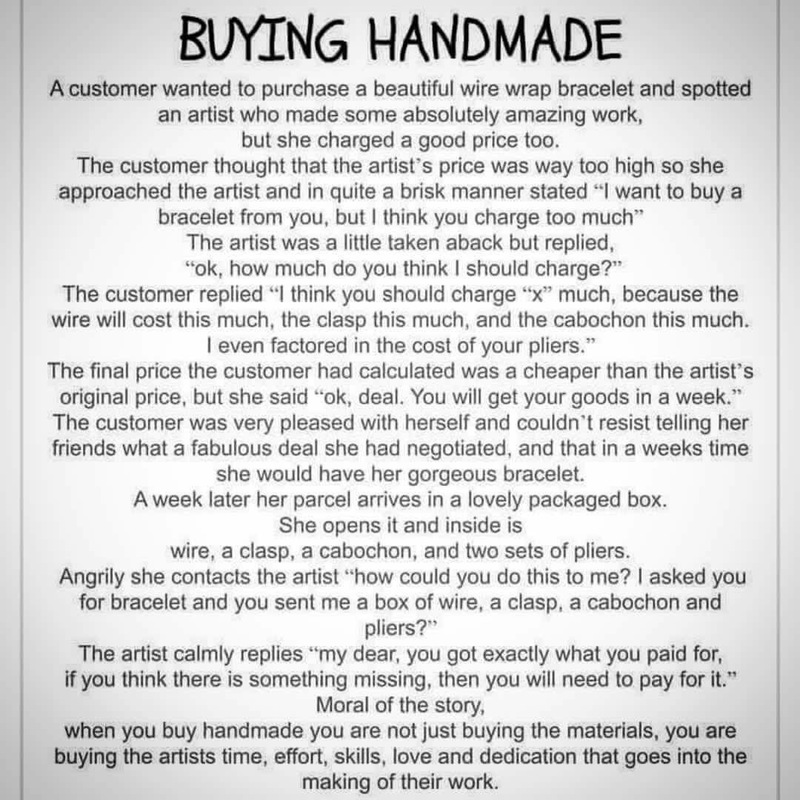 This is an important concept for patrons of handmade artisan goods to keep in mind. But what about the artists? This is one of those posts that hits us artists at the core until we shout out “AMEN SISTER!” But we artists play a very important role in the value and appreciation of our craft. We communicate that value through our pricing. If we as artists do not appreciate our own work for what it is truly worth — not just the tools and supplies — no one else will. That person in the story who made a “deal” with the artist is often the little devil of self-deprecation who sits on our shoulder to cut us down as we design our commission price lists or price our merchandise. You are doing more than that! And you will still get commissions, just fewer ones that are worth more money thus compensating your time better. Here’s a word problem: Do you want to make 10 things that are worth $1 each or one thing that is worth $10? Answer: Either way makes you $10 richer… But it depends on whether you like to be boss, manager, and employee in your very own art sweatshop as you work for pennies and please the unruly masses… or if you want to make money and grow a legitimate business in a community that appreciates you and your work. Hmmm. Tough decision! If you undersell yourself, you may get a few generous patrons who will tip or pay extra. I have done this in the past when I see an artist is undervaluing themselves. Most people see the undervalued commission as a bargain, a “cheap” commission option. They don’t consider how you are gutting your prices to make customers more likely to throw some pennies at you and leave you to tread water as you struggle through a monstrous commission queue of 2-4hr long commissions priced at $2-15! It’s not the people on the queue who are to blame; it was you. [“The calls are coming from inside the house! !”] You are thwarting yourself. You basically said “I have art that I’m selling at 65-75% off! Come and get it” then wonder why you are under pressure and not making much cash while still working a soul-crushing day-job. And you certainly should not let the immature, the childish, and the ignorant masses of the Internet dictate your prices. Does a 12yr old know how to manage finances let alone understand the effort, expense, and years involved in honing artistic talents? Not likely. If your work is too “expensive” for them, they can save up, grow up, ask mom, or move on. When you have a product that is just out of reach of the masses, that shows your work is to be admired and aspired to and adds onto the “exclusivity” and “cache” of having an original [your name here.] It seems hoity but it’s also psychological. If everyone has it, it’s not a big deal. When only the elite have it, oh man. I don’t care what it costs because I want it. Art sure as hell isn’t easy but there is no reason to make it harder than it already is. You shouldn’t be an art slave unless you are getting paid for everything you contribute. Credit isn’t enough. Exposure isn’t enough. So well written, Carrie, and well said! I’m going to carry that line, “The calls are coming from inside the house” – says it all! It’s called negotiation. You start high, they offer low, and hopefully you end up with a price that both can live with. Don’t sell yourself short. But if you get all huffy the minute you get any push-back, you’re making it harder to succeed in business. I agree! This is a fair point! There are instances where I have slapped a price on something then realized “wait that’s kind of insane” and reduced prices. There’s a time for negotiation but there’s a time, a place, and a price range when that’s acceptable. However for more context: most of the artists that I have aimed at inspiring are already working at lower than a living wage ($1-4 per hour or lower) and they wonder why they have no inspiration, no motivation, and keep treading water (or are just plain drowning.) It’s because they give in to the “that’s too expensive” and “Will you accept [less than 50% of the price listed]?” comments on commission offerings that are already dismally low for the effort, materials, time, and quality of the product. When we talk about the value of arts and culture to society, we always start with its intrinsic value. Excellent post I want to thank you for this informative read; I really appreciate sharing this great post. Keep up your work.